Heritage week 2013, which runs from Sat 16th August to Sun. 24th, is packed full of exciting events, walks talks and exhibitions celebrating Kildare rich and varied heritage and everyone is invited to get involved. “I am amazed at the number and variety of events happening during this year's Heritage Week. All credit to local community and heritage groups for their enthusiasm for the week.” said Bridget Loughlin, County Kildare Heritage Officer. For those interested in built heritage many buildings will be open to the public for the week including the Round House, Batty Langley Lodge and Kildrought House in Celbridge, Leixlip Castle and St. Mary’s Church Leixlip. For the wildlife lovers there is an opportunity to get involved in a Swallow ringing project in Pollardstown fen , take a bog walk to Moods and Clongory bogs, learn about eh hedgerows of Ballymore, bird watching in Donadea , bee keeping in Castletown House, bats in Donadea. A number of Kildare libraries will be hosting exhibitions on Kildare’s natural heritage. There are some novel events this year such as: sharing local memories in Kilcullen, traditional Irish cookery demonstration in Kildare, a bus tour of local Maynooth heritage sites Sean Nos Song and Dance Kildare and Newbridge Heritage Trail Quiz. Local groups have organised a variety of talks: Garret Mor Fitzgerald at Maynooth Castle, the Griffith Family of Millicent House in Clane, the 1913 lockout in Naas, Athy and Kildare, and the transportation of women to van Diemen’s land. Many heritage walks have been organised by local groups to promote the unique heritage of their area such as the churches of Ardclough, the heritage of Celbridge and the flora and fauna of Straffan. 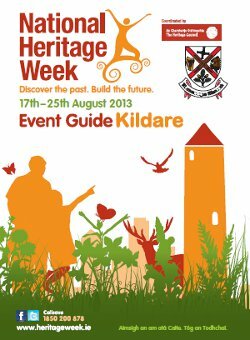 Visit Kildare County Council for a listing of all of the Kildare Heritage Week events. Brochures of events are available on www.kildare.ie, all local libraries and credit unions. To view a listing of Heritage Week events in other counties please go to www.heritageweek.ie or call 1850 200 978.